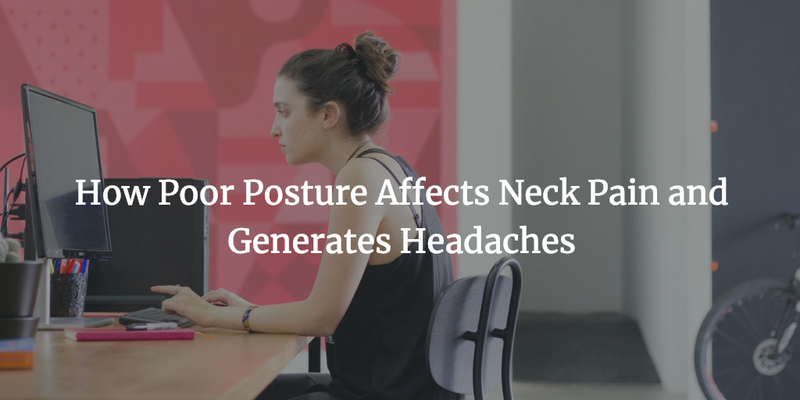 One of the main causes of neck pain and headaches is a result of inadequate posture. Often is the case, that when someone recognizes and understands strength as it relates to posture, it can play an important roll in finding neck pain relief. What is Good and Bad posture? Good posture, as far as the neck goes, is characterized by the ears in positions directly above the shoulders. The chest is vertical and shoulders are naturally positioned back. Poor posture makes it difficult to exercise and improve your muscle strength. This position with the ears aligned above the shoulders and chest up is considered neutral posture. It minimizes the stress on the neck because the head is perfectly balanced on the neck, like a ball on a pencil. The mechanical load is creating more stress on the cervical spine. The further your head is forward, the more your body has to work. Over time it creates chronic tension on the joints. This forward head position trickles down the kinetic chain in your body. Eventually, this will lead to a rounded upper back and a tucked pelvis. Ever see those older guys walking with a cane and their head is 12 inches in front of their hips? That may be your future if you don’t take action. Cumulative trauma. The muscles can only do so much for so long before they start to send pain signals that they are not happy. Spasming is the body’s natural response to protect the spine. So you will get tighter and tighter muscles and weaker if not strengthened. Hunch back. As I mentioned before, the kinetic chain is now compromised and gravity will start to win the battle to drag you to the floor. Your body’s poor strength no longer has the ability to support your head even with those stronger thoracic muscles. Chronic tension. The neck will have chronically short muscles just below the base of the skull (suboccipital) and sternocleidomastoid muscle. Have you ever tried stretching a short hamstring? Well stretching these muscles are not as easy as stretching a hamstring, and even so, they are difficult to stretch because of position and the bodies natural protection mechanism. The longer you maintain poor strength in the neck and back coupled with poor habits of slouching, the longer it takes to fix poor posture, and the more likely it is for neck pain and headaches to develop. Muscle unevenness. What people call upper-crossed syndrome in the realm of neck pain. Muscles in the upper neck and chest are tight as well as some of the anterior neck muscles, while the upper back and anterior neck muscles are long and weak. Degenerative disease of the neck. The added stress on the joints and the discs and vertebrae increases the likeliness of cervical osteoarthritis and degenerative disc disease of the cervical spine. Reduced range of motion. Try this, with your head over your shoulders, turn your head left and right. Now stick your head forward as far as you can and turn your head left and right. Notice the motion difference? If you have trouble looking over your shoulder while driving. This may be one of the reasons why.